In cased you missed it in comments, music-with-bikes resources continue to pour in. 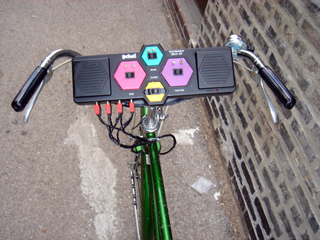 If you haven’t found yourself inspired to make music with bikes yet, this should do the trick. 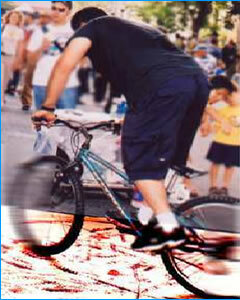 And added to the compositions for bikes, Mauricio Kagel has another piece of music. I think we need something new, then, like a Segway Symphony. How long have you been playing bicycle? Listen to the beautiful whistling sound he gets out of the handlebars. Technically not “digital music” but note that what a lot of these projects have in common is amplification. The microphone unlocks all kinds of hidden sonic worlds not experienced in previous centuries, just by making the inaudible audible.